586 lineal feet of Shoring in 4 days! We were called in to install shoring in a situation where they were not able to excavate to a 1:1 slope so another solution was required (us!). 586 lineal feet of 16 foot shoring was installed as a temporary shoring wall to keep cribbers, equipment operators, surveyors, etc SAFE in the excavation. 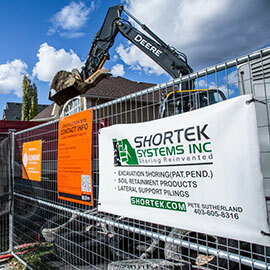 Can we help you with an excavation shoring project? Get in touch with us today.